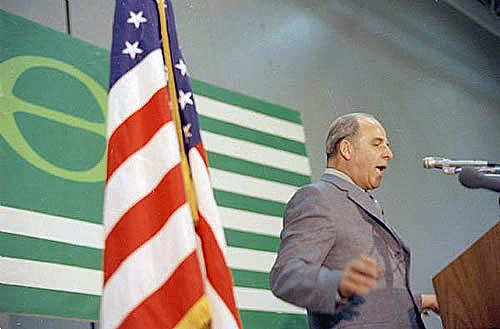 Sen. Gaylord Nelson giving an Earth Day speech in Denver, Colo., on April 22, 1970. I congratulate you, who by your presence here today demonstrate your concern and commitment to an issue that is more than just a matter of survival. How we survive is the critical question. Earth Day is dramatic evidence of a broad new national concern that cuts across generations and ideologies. It may be symbolic of a new communication between young and old about our values and priorities. Take advantage of this broad new agreement. Don’t drop out of it. Pull together a new national coalition whose objective is to put Gross National Quality on a par with Gross National Product. Campaign nationwide to elect an “Ecology Congress” as the 92nd Congress – a Congress that will build bridges between our citizens and between man and nature’s systems, instead of building more highways and dams and new weapons systems that escalate the arms race. Earth Day can – and it must – lend a new urgency and a new support to solving the problems that still threaten to tear the fabric of this society… the problems of race, of war, of poverty, of modern-day institutions. Ecology is a big science, a big concept – not a copout. It is concerned with the total eco-system – not just with how we dispose of our tin cans, bottles and sewage. Enviromnent is a problem perpetuated by the expenditure of billions a year on the Vietnam War, instead of on our decaying, crowded, congested, polluted urban areas that are inhuman traps for millions of people. If our cities don’t work, America won’t work. And the battle to save them and end the divisiveness that still splits this country won’t be won in Vietnam. Winning the environmental war is a whole lot tougher challenge by far than winning any other war in the history of Man. It will take $20 to $25 billion more a year in federal money than we are spending or asking for now. Our goal is a new American ethic that sets new standards for progress, emphasizing human dignity and well being rather than an endless parade of technology that produces more gadgets, more waste, more pollution. Are we able to meet the challenge? Yes. We have the technology and the resources. Are we willing? That is the unanswered question. Establishing quality on a par with quantity is going to require new national policies that quite frankly will interfere with what many have considered their right to use and abuse the air, the water, the land, just because that is what we have always done. Speech courtesy of the Wisconsin Historical Society.